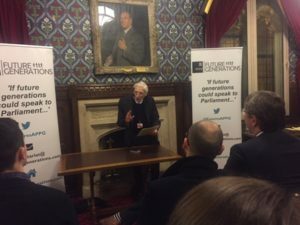 In his opening speech, Professor Martin Rees – the cosmologist and Astronomer Royal – said that he regretted the short-termism of UK policy-making and claimed that the interests of future generations have become more important than ever because of new technology and the destructive power of humans. He says that promoting the interests of future generations is unlikely to start with politicians and will happen only when there is a large public movement to force change – as happened with gay rights, and racial equality. We in Spaceship Earth, says Rees, have too little awareness of the need for horizon scanning. 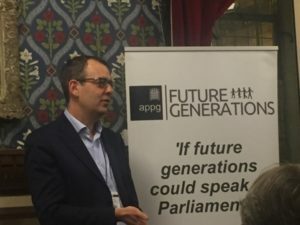 The Head of the Department of Politics and International Studies at Cambridge, Professor David Runciman, supported these arguments, but said that change in favour of future people is very hard to bring about in a democracy. A warrior for future generations from Hungary, Dr Marcel Szabo, observed that in the last 40 years as many as half of all vertebrate species have been driven to extinction and the human population is set to grow from 7.5 billion to 11 billion over the next 30 years, with all the consequent demands on natural resources. As a former Ombudsman for Future Generations, Szabo made the case that legal systems can go a long way towards protecting coming generations, and gave the example of the German Constitutional Court which is currently putting legal checks in place to protect future generations. Imagine, says Szabo, what you could do for future people if you spent just 1% of nations’ incomes on protecting them. Also from Hungary, the inspiring Katalin Sulyok was supportive: she is now using her role as the Head of Department at the office of the Ombudsman for Future Generations to campaign for cleaner air, to clear up old pollution and to create mechanisms to make industrialists put aside funds for future clean-ups. 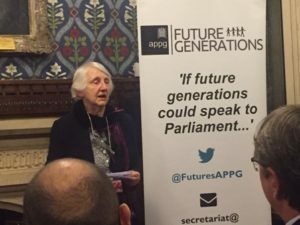 Baroness Onora O’Neill, a philosopher who is actively supporting the new APPG, explained that this is all about our duties to future generations. She believes that duty was the dominant sentiment 100 years ago but it was patriotic duty which led to the disaster of the First World War. This discredited the notion of duty, and by the 1960s the prevailing sentiment was all about rights rather than obligations. This concentration on the rights of the living has left those of the unborn neglected. Baroness O’Neill wants us to act on our duties to future generations. 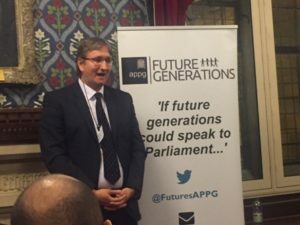 Encouragingly, the new “Future Generations APPG” is being driven by younger people, some of whom may – as Martin Rees pointed out – still be alive in the year 2100. These enthusiastic Cambridge graduates and students are led by Tildy Stokes and Natalie Jones, with their media relations being covered by Julia Hutz. They obviously have strong support from their contemporaries, as shown by the number of younger people at the launch. 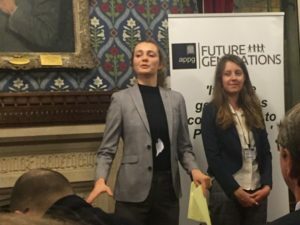 Interestingly, no one drew a parallel between the way older generations have treated younger ones over housing, pensions and public debt and the short-termism that has precipitated this intergenerational unfairness – probably not because it’s too contentious, but because they want their focus to be on future generations rather than younger generations.